We at 314 Design Studio take great pride in our tradition of excellence in our craft. When it comes to kitchen remodeling, our name stands out among all companies offering such service to Annapolis, Kent Island, and Chester property owners. One quick look at our portfolio and you’ll see just how much focused we are on rendering even the smallest details that other contractors take for granted. For us, no request is too trivial and no task is too ambitious – we will bring our A-game nonetheless. Contact us soon so we can begin discussing your kitchen remodeling needs. Why Go for a Kitchen Remodel? There are some great reasons that merit a kitchen remodeling job. First, the current kitchen layout maybe too cramped and thus impedes mobility. It could also be posing some safety issues to anyone in the kitchen. Homeowners also sometimes just want a new design or theme for their kitchens. Others desire some new amenities like top-notch kitchen appliances to satisfy their cooking requirements. But whichever of these reasons apply to you, rest assured that you can tap our expertise and creativity to render your desired new look and functionalities for your kitchen. Extra storage/custom cabinetry. With the help of our in-house designers and artisans, we can provide exquisite, personalized cabinetry that will beef up your kitchen storage. Countertops. Whether you prefer a tile or granite countertop, we’ll have our personnel create a customized unit and install it accordingly. Heavy-duty kitchen appliance. From grills and burners to rotisseries and pizza ovens, we can supply the best kitchen appliance courtesy of our partners. We carry only the best brands to satisfy clients with discriminating taste and demanding kitchen needs. Lighting. Every knowledgeable homemaker knows that lighting is crucial to achieving a safe and attractive kitchen. 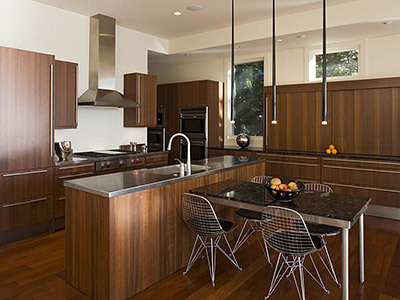 Hence, we only install the finest lighting fixtures to make our clients’ kitchens conducive to meal preparations. Why Hire Us for Your Kitchen Remodeling Needs? We have been handling kitchen remodeling tasks for decades combined. With us, you can surely realize your kitchen improvement ideas no matter how simple or grand they are. Our creative designers and expert builders are trained to establish good rapport and maintain open communication with you throughout the project duration. This allows us to fully satisfy your needs and ensure timely project completion. 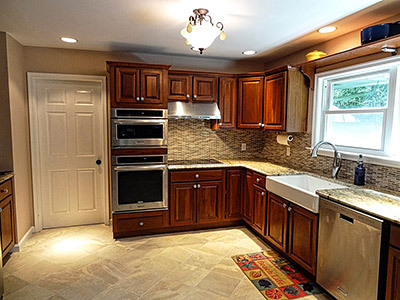 We’re known across the state, particularly in Annapolis, as a kitchen remodeling company offering customized designs. We likewise have suppliers of first-class kitchen materials and accessories, like cabinetry, appliances, countertops, and others. All these guarantee a one-of-a-kind kitchen that is not only beautiful but also truly unique and 100 percent functional. If you have questions, or if you want an honest, upfront cost estimate of your planned kitchen remodeling project, please call us at 410-643-4040. We service clients in Annapolis, MD and nearby locations. Let us make your kitchen the next best spot in your home by hiring us today.